Bohemia is a historical region in central Europe comprising the western and central thirds of the Czech Republic. It has an area of 52,750 km² and comprises 6 million of the country's 10 million inhabitants. It is flanked by Germany, Poland, the Czech historical region of Moravia, and Austria, and its border is formed by four mountain ranges. Bohemia was unified under the Premyslid dynasty, under whose helm it also became an autonomous part of the Holy Roman Empire after accepting Christianity in the ninth century. Charles IV, Holy Roman Emperor, of the subsequent Luxembourg dynasty established Central Europe's first university in Prague and laid down the formula for the region's economic, cultural, and artistic boom. The period of glory was repeated under Emperor Rudolph II Habsburg, who embraced artists and scientists from all over Europe. Through the Hussite Wars in the fifteenth century, Bohemia took a stand for the freedom of religion, drawing on the spiritual strength and martyrdom of Jan Hus. Led by the ingenious Jan Žižka, the under-armed and under-trained, yet disciplined and arduous, peasant armies believed they were invincible as long as they stayed united in faith. For the most part, Bohemia's history was intertwined with that of Germany and Austria, from which it benefited both economically and culturally, while at the same time facing varying degrees of oppression. 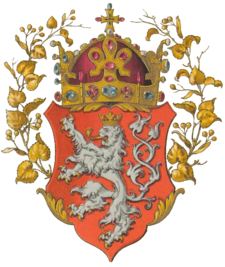 The Coat of arms of the King (and Kingdom) of Bohemia. The country ceased to exist in 1918, with the formation of the joint state of Czechs and Slovaks: Czechoslovakia. After World War II, Czechoslovakia aligned itself with the communist bloc, from which it was extricated in 1989. Four years later, Czechs and Slovaks parted amicably, and Bohemia became part of the Czech Republic. The first unequivocal reference to Bohemia dates back to the Roman times, with names such as Boiohaemum. Germanic for "the home of the Boii," a Celtic people. Lying on the crossroads of major Germanic and Slavic tribes during the Migration Period, the area was settled from about 100 B.C.E. by Germanic peoples, including the Marcomanni, who then moved southwest and were replaced around 600 C.E. by the Slavic precursors of today's Czechs. After freeing themselves from the rule of the Avars in the seventh century, Bohemia's Slavic inhabitants appeared in the ninth century under the rule of the Premyslids (Přemyslovci), the first historically proven dynasty of Bohemian princes, which lasted until 1306. A legend says that the first Premyslid prince was Přemysl Oráč, who married Libuše, the founder of Prague, but the first documented prince was Bořivoj I. The first Premyslid to use the title of King of Bohemia was Boleslav I, after 940, but his successors again assumed the title of duke. The title of king was then granted to Premyslid dukes Vratislav II and Vladislav II in the eleventh and twelfth centuries, respectively, and became hereditary under Ottokar I in 1198. With Bohemia's conversion to Christianity in the ninth century, close relations were forged with the East Frankish kingdom, then part of the Carolingian empire and later the nucleus of the Holy Roman Empire, of which Bohemia was an autonomous part, from the tenth century on. Under Boleslav II “Pious,” the Premyslid dynasty strengthened its position by founding a bishopric in Prague in 973, thus severing the subordinate relationship of Czech Christianity to that of Germany and opening up the territory for German and Jewish merchant settlements. Concurrently with the Premyslids, the powerful House of Slavnik were working to establish a separate duchy in the eastern part of Bohemia—backed by a military unit and powerful fortresses, and went on to gain control over more than one-third of Bohemia. In 982, Vojtech of the Slavnik dynasty was appointed Prague bishop and sought an independent status of the Church vis-a-vis the state. His brothers maintained ties with the German ruler and minted their own currency. The Czech lands thus saw a simultaneous development of two independent states—of the Premyslids and Slavniks. Boleslav II did not tolerate this competition for long and in 995 had all Slavniks murdered, an act that marked the unification of Czech lands. 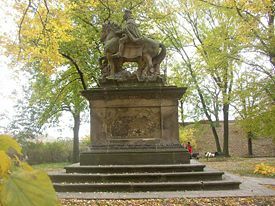 Statue of St. Wenceslas by Jan Jiri Bendl. Ottokar I’s assumption of the throne in 1197 heralded the apex of the rule of the Premyslid dynasty and the rule of Bohemia by hereditary kings. In 1212, Roman king Friedrich II affirmed the status of Bohemia as kingdom internationally in a document called the Golden Bull of Sicily. This gave the Czech kings a privilege to name bishops and extricated the Czech lands from subjection to Roman rulers. Ottokar I’s grandson Ottokar II, who ruled in 1253–1278, founded a short-lived empire that covered modern Austria. From the second half of the eleventh century, Czech statehood began to be galvanized by the murder of St. Wenceslas (sv. Václav) and his subsequent veneration as the prince from heaven and protector of the Czech state. Czech rulers began to be seen as merely temporary representatives of the state. The son of Premyslid duke Vratislav I, St. Wenceslas was raised by his grandmother, Ludmila, who was murdered shortly after the rule was passed to him, most likely by his mother Drahomíra, whom he repudiated after the act only to take her back later. Wenceslas facilitated the development of the Church and forged ties with Saxony rather than the customary relations with Bavaria, to the chagrin of his political opposition headed by his younger brother Boleslav I “Terrible.” This brotherly standoff ended in murder—Boleslav I had his brother killed in 935 on the occasion of the consecration of a church and took over the reign of the Czech lands. Wenceslas has been worshipped as a saint from the tenth century on, first in the Czech lands and later in neighboring countries. His life and martyrdom were written into numerous legends, including the “First Old Slavonic Legend” that originated in the tenth century. The mid thirteenth century saw the beginning of substantial German immigration as the court sought to replace losses from the brief Mongol invasion of Europe in 1241. The Germans settled primarily along the northern, western, and southern borders of Bohemia, although many lived in towns dispersed throughout the kingdom. The death of the last Premyslid duke, Wenceslas III (Václav III), left the Czech dukes in a period of hesitation as to the choice of the Czech king, until they selected John of Luxembourg “Blind,” the son of Friedrich VII, the king of Germany and Roman Empire, in 1310, with conditions, including extensive concessions to be granted to themselves. John married the sister of the last Premyslid but the Czech kingdom was an unexplored territory for him; he did not understand the customs or needs of the country. He ruled as the King of Bohemia in 1310-1346 and the King of Poland in 1310-1335. Being a shrewd politician nicknamed “King Diplomat,” John annexed Upper Silesia and most Silesian duchies to Bohemia, and had his sights set at northern Italy as well. In 1335, he gave up all claims to the Polish throne. In 1334, John appointed his oldest son Charles IV as the de facto administrator of Czech lands, setting off the period of Luxembourg dual reign. Six years later, he safeguarded the Czech crown for Charles and seconded his endeavors to obtain the Roman kingship, in which Charles succeeded in 1346, still during his father’s life. Charles IV was crowned as the King of Bohemia in 1346 and labored to uplift not only Bohemia but also the rest of Europe. As the Holy Roman Emperor and the Czech king, dubbed the “Father of the Country” (Pater patriae in Latin), he is the most notable European ruler of the late Middle Ages. In line with the Luxembourg tradition, he was sent at a very young age to the French court, where he received extensive education and acquired mastery of German, French, Latin, and Italian languages. Czech language was the closest to his heart though, and two years into his election as king, he founded central Europe's first university, Charles University, in Prague. In 1355, Charles IV ascended to the Roman throne, and a year later he issued the Golden Bull, a set of statutes—an early constitution—to be valid in the Holy Roman Empire until 1806. His reign lifted Bohemia to its peak both in terms of policy and territory; the Bohemian crown controlled such diverse lands as Moravia, Silesia, Upper Lusatia and Lower Lusatia, Brandenburg, an area around Nuremberg called New Bohemia, Luxembourg, and several small towns scattered throughout Germany. He triggered an unprecedented economic, cultural, and artistic boom in Prague and the rest of Bohemia. Petrarch, the initiator of Renaissance Humanism, with whom he corresponded, hoped in vain that Charles IV would transfer the capital of the Holy Roman Empire from Prague to Rome and renew the glory of the Empire. Construction in the city was in full swing during the king's life, and many sights bear his name. 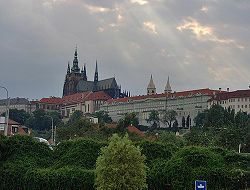 The Prague Castle and much of the Saint Vitus Cathedral were completed under his patronage. Charles IV’s son, Emperor Sigismund of Luxembourg, the last of the House of Luxembourg on the Czech throne, as well as the King of Hungary and Holy Roman Emperor, left behind a legacy of contradictions. He lost the Polish crown in 1384, but gained the Hungarian crown in 1387. In an effort to amalgamate the Dalmatian coast under his sovereignty, he organized a crusade, but was defeated by the Osman Turks. After a brief internment by the Hungarian nobility in 1401, he refocused his efforts on Bohemia and lent his support to the higher nobility fighting his step-brother, King Wenceslas IV, whom he later took hostage and transferred to Vienna for more than a year. As an administrator of the Czech Kingdom appointed by Wenceslas IV, he boldly took over the Czech crown. After the brothers’ reconciliation in 1404, Sigismund returned to Hungary, where he calmed political turbulence and initiated an economic and cultural boom, granting privileges to cities which he considered as the cornerstone of his rule. He also considered the Church subordinate to secular rule, and in 1403-1404, after disputes with the Pope, he banned monetary appropriations for the Church, staffed bishoprics, and other religious institutions. As a Roman king, Sigismund sought to reform the Roman Church and settle the papal schism, a token of which was the convening of the Council of Constance in 1415. 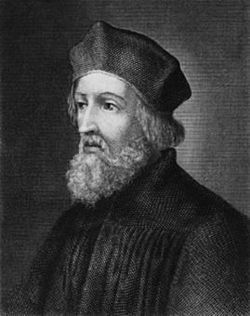 There the rector of Charles University and a prominent reformer and religious thinker Jan Hus was sentenced to be burned at the stake as a heretic, with the king’s undeniable involvement. Hus was invited to attend the council to defend himself and the Czech positions in the religious court, but with the emperor's approval, he was instead executed on July 6, 1415. His execution, followed by the papal crusade against the Hussites as well as the persecution of John Wycliffe, outraged the Czechs, and their ensuing rebellion against Romanists became known as the Hussite Wars. Although a natural successor to Wenceslas IV, as a Czech king, Sigismund, who inherited the Czech throne in 1420, grappled with defiance from the Hussites, whom he unsuccessfully sought to subdue in repeated crusades. Only in 1436, after he agreed to reconciliatory terms between the Hussites and the Catholic Church, was he recognized as the Czech king. He died one year later. "You who are the warriors of God and His law. Ask God for help and hope in Him that in His name you may gloriously triumph" (from a Hussite battle hymn). The Hussite Wars, which began in 1419, sent people flocking to Prague, plundering monasteries and other symbols of what they viewed as the corrupt Catholic Church, but it was under Jan Žižka, the mastermind of the best defense strategy for the largely peasant Hussites, that the wars against Sigismund’s crusades began to gain momentum. The Hussite Wars split the general Hussite movement into various groups of moderates and radicals. The moderates, essentially in support of the Catholic Church, were called Ultraquists and consisted of the lesser nobility and the bourgeoisie. The most radical division was the Taborites, named after their religious center and stronghold at Tábor, which was founded by Žižka. Upholding the doctrines of Wycliffe, this group consisted of peasants. Žižka, born into a family of lower nobility, began his military career by joining an armed gang formed by members of his class to rob merchants, and took part in minor conflicts among wealthy nobles. After he helped defeat Prussia's Teutonic Knights in the Battle of Grunwald in 1410, he returned to Prague and joined the king's court at the time when Hus preached regularly in Prague’s Bethlehem Chapel, but it was never proved whether he attended any of Hus's sermons. The outbreak of the Hussite Wars created an opportunity to hone his tactical genius. When the wars began, Žižka was approaching 60 and was blind in one eye. Soon after joining the Taborites, he transformed the town of Tabor into a fortress that was next to impossible to topple. In 1420, he led the Taborite troops in their startling victory over Sigismund, where the king lost despite assistance from Hungarian and German armies. Emboldened by the victory, Žižka’s armies spread over the countryside, storming monasteries and villages and defeating the crusaders, even though Žižka had become completely blind by 1421. Since he was commanding a largely peasant formation, Žižka devised weapons that took into account natural skills of his warriors, such as iron-tipped flails and armored farm wagons, which were mounted with small howitzer-type cannons and broke through enemy lines easily. The wagons were also used to transport the troops, and it can be said that they were the precursors of modern tank warfare. Another of his tactics was lining the bottom of a pond beside his forces with women's clothes, which resulted in the enemy cavalry’s horses being trapped in the clothing, becoming an easy prey to men. This made it possible for him to defeat the 30,000-strong army of crusaders that arrived in Prague from all over Europe. He even ordered horses shoed the wrong way round, to confuse enemy troops on the direction of his forces. Another, if not more important, Hussite asset was their conviction that they were fighting for the right cause, and when they sang the battle hymn “You who are God’s Warriors,” the enemy would frequently turn back before the battle started. Their "divine" conviction gave them strength to follow rigid discipline and a strong organization system. This could not be said of their foes, whose goals oftentimes were the accumulation of the spoils of war. Nevertheless, his extreme religious views began to clash with those of the Taborites, who were more radical in their views, so he left the city to form his own, more moderate, Hussite wing in East Bohemia in 1423, while at the same time retaining a close alliance with the Taborites. Considered the greatest genius of battlefield in Bohemia’s history, he died suddenly of the plague in 1424, with virtually no possessions of his own. 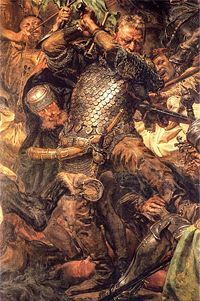 He was succeeded by Prokop the Great, under whose lead the Hussites continued to score victories for another ten years, to the sheer terror of Europe, until they were torn apart by internal rivalries at the Battle of Lipany in 1436. This was a direct consequence of their division into two main factions, the moderate Ultraquists and the radical Taborites and the reunification of the former with the Catholic Church. This prompted Sigismund to declare the famous "only the Bohemians could defeat the Bohemians." Although the Hussite movement ultimately failed, it was the first attempt to undermine two strongholds of medieval society—feudalism and the Roman Catholic Church. It not only paved the way for the Protestant Reformation and the rise of modern nationalism, but also brought about military innovations masterminded by Žižka. Despite the crushing defeat in 1436, the Ultraquists were still in the position to negotiate reconciliation between Catholics and themselves, thus safeguarding freedom of religion, albeit short-lived, as coined in the Basel Compacts. In 1458, George of Poděbrady took over the Bohemian throne and set out to create a pan-European Christian League that would consolidate all of Europe into a Christian entity. He appointed Leo of Rozmital to win support of European courts, but this effort was stalled by his deteriorating relationship and thus the loss of leverage with the Pope. After the death of King Louis II of Hungary and Bohemia in the Battle of Mohács in 1526, Archduke Ferdinand of Austria was elected the King of Bohemia, and the country became a constituent state of the Habsburg Monarchy, enjoying religious freedom as one of the most liberal countries of the Christian world between 1436 and 1620. Political and religious policies of Rudolf II, King of Hungary and Bohemia and Holy Roman Emperor (ruled 1576–1612), have made him a controversial figure, subject to adversarial actions by members of his own family. He was ousted from his post, which facilitated the outbreak of the Thirty Years' War (1618–1648), one of the most destructive wars in European history. Labeled as "the greatest art patron in the world," Rudolf II distinguished himself by pushing the boundaries of court patronage in post-Renaissance Europe. Prague, referred to as Rudolfine during his era, became one of the leading centers of the arts and sciences in Europe. He became a believer in and practitioner of the occult, promoting alchemy and the Kabbala, and invited leading European artists, architects, scientists, philosophers, and humanists to work for him. The astronomers Tycho Brahe, who was made Imperial Mathematician in 1599, and Johannes Kepler established observatories in the city. The emperor commissioned the redesign and expansion of the castle, the construction of a new town hall and archbishop's palace, and several new churches, although his greatest contribution to arts lies in painting, sculpture, and the decorative arts, including those by Paolo Veronese, Correggio, Leonardo da Vinci, Albrecht Dürer, and Pieter Bruegel the Elder. He cherished foreign artists above all, as they purportedly gave international weight to his rule and satisfied his hunger for Italian and Dutch work, in particular. His unbridled passion for collecting is evidenced by one of the greatest art collections among European courts, which reflected the broader scientific and artistic interests of his court. He amassed not only antiques but also recent and contemporary art. His painters doubled as dealers to purchase works of art from all over Europe. By nurturing his artists in their workshops, he raised the status of the painters' guild to that of a liberal art. However, shortly after his death in 1612, his collections were largely repossessed. Rudolf II had another side, of volatile and physical and psychological maladies, which prompted him to retreat to his castle in Prague, where he focused on the occult. Partly responsible for his internal torment was the increasingly divisive struggle between Catholics and Protestants and the threat posed by the Ottoman Empire, which was behind his decision to move the capital of the Habsburg Monarchy from Vienna to Prague. He was educated at the leading Roman Catholic powerhouse in Europe, the court of Philip II (ruled 1556–1598) of Spain, but by the time his father, Emperor Maximilian II, died, a majority of Habsburg subjects had converted to various sects of Protestantism, as had the estates in most of the Habsburg lands. Rudolf II invited the Jesuits to help him reconvert Protestants, which stirred resistance from the Protestant estates, and in 1606, the Estates of Hungary, Austria, and Moravia voted to recognize his brother, Matthias (ruled 1612–1619), as ruler. Rudolf II responded with a concession in 1609—promising the Bohemian estates religious tolerance in return for his retention as sovereign ruler. This did not satisfy the estates though, instead setting in motion a chain of events that would culminate in the Second Defenestration of Prague in 1618, and the outbreak of the Thirty Years’ War during the reign of King Ferdinand II. Ferdinand II adamantly oppressed Protestant rights in Bohemia; consequently, the Bohemian nobility elected Frederick V, a Protestant, to replace Ferdinand on the Bohemian throne. However, the Protestant intermezzo ended abruptly with Frederick's defeat in the Battle of White Mountain in 1620. Many Protestant noblemen were executed or driven to exile, their lands transferred to Catholic loyalists. In 1749, Bohemia became more closely connected to the Habsburg Monarchy following an approval by the Bohemian Diet of an administrative reform that included the indivisibility of the Habsburg empire and the centralization of rule. The Royal Bohemian Chancellery was thus merged with the Austrian Chancellery. Until 1627, the German language was the second official language in the Czech lands. Both German and Latin were widely spoken among the ruling classes, although German became increasingly dominant, while Czech was more common on the countryside. The development of the Czech language among educated classes was restricted after the Battle of the White Mountain; the situation improved only marginally during the Enlightenment era, when the Czechs revised and rebuilt the language. The first notable figure of the Czech Slavic renaissance was Josef Dobrovský (1753-1829), a Jesuit priest who authored grammar books and dictionaries and is considered the first Slavist. Josef Jungmann (1773-1847) went further by focusing on the compilation of a Czech-German dictionary and writing a history of Bohemian literature in Czech, efforts that earned the Czechs permission by the authorities to teach Czech in high schools, albeit not as a language of instruction. Pavel Josef Šafařík, a Slovak by birth, was another outstanding Slavist of the Czech renaissance movement. At the end of the eighteenth century, the Czech national revival movement—Czech renaissance movement—in cooperation with part of the Bohemian aristocracy, launched a campaign for the restoration of the historic rights of the Czech Kingdom, whereby the Czech language was to replace German as the language of administration. The enlightened absolutism of Joseph II and Leopold II, who introduced minor language concessions, showed promise for the Czech movement, but many of these reforms were later rescinded. During the Revolutions of 1848, many Czech nationalists called for autonomy for Bohemia from Habsburg, Austria. The Prague Slavic Congress was a crucial attempt to secede from the monarchy. Delegates from individual Slavic nations met to draw up a plan for further action, both on the national and the international levels. Although the congress was marred by riots and martial law, its accomplishment lay in the drafting of the petition of Slavic demands that provided a blueprint for equality among nations. The old Bohemian Diet, one of the last remnants of the independence, was dissolved, although the Czech language experienced rebirth as in the period of Romantic nationalism. In 1861, a newly elected Bohemian Diet was established. The renewal of the old Bohemian Crown (Kingdom of Bohemia, Margraviate of Moravia, and Duchy of Silesia) became the official political program of both Czech liberal politicians and the majority of Bohemian aristocracy (state rights program), while parties representing the German minority and a small part of aristocracy proclaimed loyalty to the centralistic constitution. After the defeat of Austria in the Austro-Prussian War in 1866, Hungarian politicians achieved the Ausgleich (compromise), which created Austria-Hungary in 1867, ostensibly guaranteeing equality between the Austrian and Hungarian portions of the empire. An attempt of the Czechs to create a tripartite monarchy Austria-Hungary-Bohemia failed in 1871, but the state rights program remained the official platform of Czech political parties until 1918. Emperor Karl I of Austria, who ruled from 1916 to 1918, was the last King of Bohemia and the last monarch of the Habsburg Dynasty, which had begun showing signs of decline in the nineteenth century, when Emperor Francis Joseph (1848–1916) lost control of Italy and Prussia. Following World War I, Bohemia declared independence and on October 28, 1918, became the core of the newly-formed country of Czechoslovakia, which combined Bohemia, Moravia, Austrian Silesia, and Slovakia. Under its first president, Tomáš Garrigue Masaryk, Czechoslovakia became a prosperous liberal democratic republic. Following the Munich Agreement of 1938, the Sudetenland, the border regions of Bohemia inhabited predominantly by ethnic Germans, were annexed by Nazi Germany; this was the first and only time in Bohemia’s history that its territory was divided. The remnants of Bohemia and Moravia were then annexed by Germany in 1939, while the Slovak portion became Slovakia. 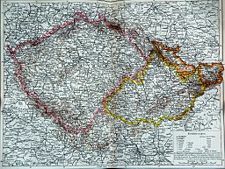 Between 1939 and 1945, Bohemia, excluding the Sudetenland, formed, along with Moravia, the German Protectorate of Bohemia and Moravia (Reichsprotektorat Böhmen und Mähren). After the end of World War II in 1945, a vast majority of the ethnic German population was expelled from the country based on the Beneš Decrees. On February 25, 1948, Communist ideologues won over Czechoslovakia and cast the country into 40 years of dictatorship. Beginning in 1949, the country was divided into districts and Bohemia ceased to be an administrative unit of Czechoslovakia. In 1989, Pope John Paul II canonized Agnes of Bohemia as the first saint in Central Europe, just before the events of the Velvet Revolution put an end to the one-party dictatorship in November of that year. When Czechoslovakia was dissolved amicably in 1993 in the Velvet Divorce, the territory of Bohemia became part of the newly emerged Czech Republic. The Czech constitution from 1992 refers to the "citizens of the Czech Republic in Bohemia, Moravia and Silesia" and proclaims continuity with the statehood of the Bohemian Crown. Bohemia is not an administrative unit of the Czech Republic; instead, it is divided into the Prague, Central Bohemian, Plzeň, Karlovy Vary, Ústí nad Labem, Liberec, and Hradec Králové Regions, as well as parts of the Pardubice, Vysočina, South Bohemian, and South Moravian Regions. Wisse, Jacob “Prague during the Rule of Rudolph II (1583-1612 C.E. )” The Metropolitan Museum of Art. Carey, Nick February 23, 2000 "Jan Zizka" Czech Radio. "Jan Zizka: The Blind General" Prague City Hotel. “Late Premyslids on the Czech Throne, Hereditary Royal Title, Peak of the Czech Middle Ages” History Info. “The Saint and Patron of Czech Lands" Biographies Online. "Father of Charles IV" Biographies Online. This page was last modified on 15 June 2016, at 19:19.